Fall is here and nothing speaks fall to me more than some warm healthy meals. Chili is definitely on that list and when I first considered making some vegan chili, I was worried it wouldn’t give me that “comfort food” feeling. Boy, was I wrong. 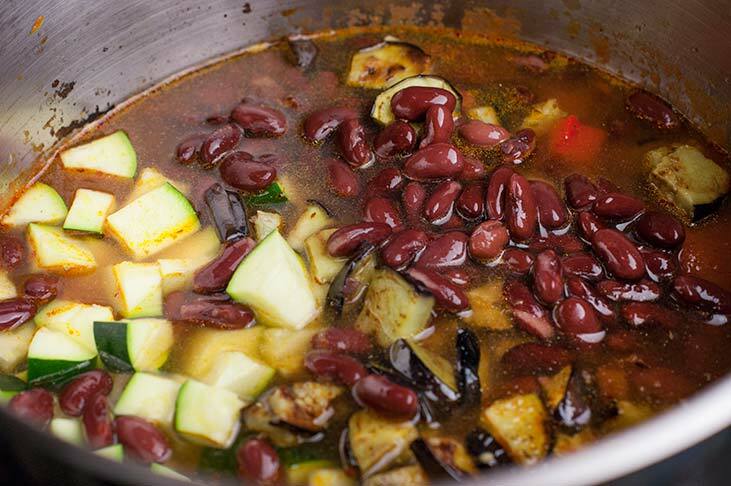 I actually think I prefer this vegan chili over any other chili recipe I have tried. It is very uplifting and really gives you that “warm” feeling. Somehow I remember the first time I made this and probably because I had multiple bowls it was that good! The chili itself is very tasty but I like to add a little extra cayenne pepper to my bowl as well as some fresh squeezed lemon juice. Yum, Yum Spicy!! I don’t make the entire batch spicy since not everyone likes it that way, nor does everyone like the lemon juice squeezed on top. You can serve them on the side for anyone who wants a little extra kick. I found the original recipe in a cook book a few years back and have since changed it up based on my preferences. I will admit that a normal bowl of chili makes me feel bloated and gross really, but I don’t get that with this one. I recommend soaking your beans for about an hour before cooking but you don’t have too. It will just help your body digest them better. 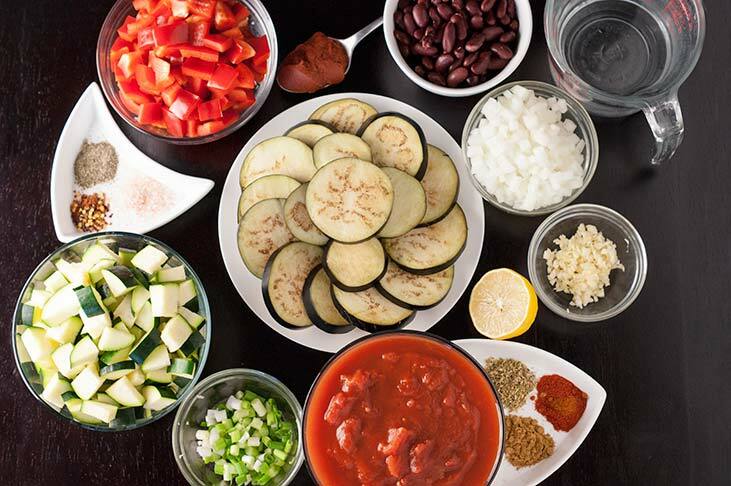 This recipe is so tasty, and I love eggplants and I feel like they really tie the recipe together. Hope you enjoy! Sauté Onions and Peppers, then add garlic and continue to sauté for another few minutes. Add in the remaining ingredients except for the green onions and “optional” ingredients. 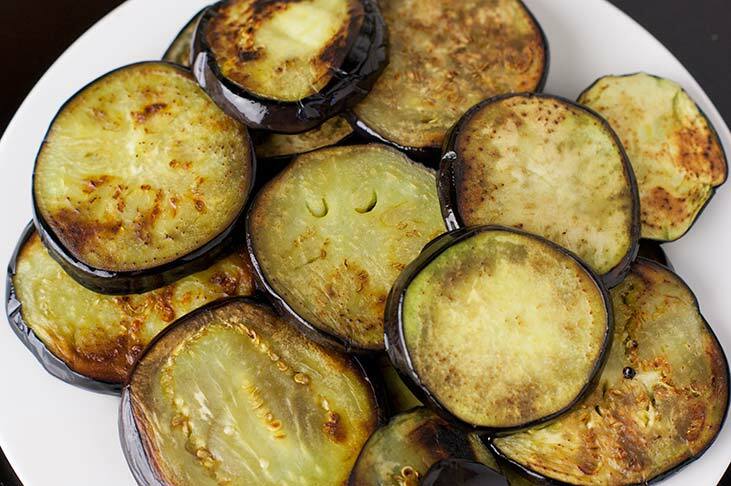 Brush each eggplant slice with Grape-seed Oil only on one side. Heat 1 Tablespoon of oil in a skillet or pan over medium heat. 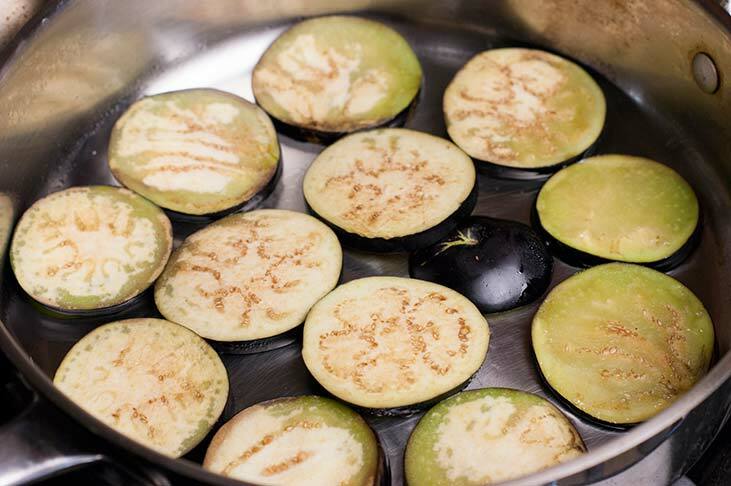 Add the eggplant slices with the oil down and cook until browned on both sides. Cut them into small pieces when finished. In a large soup pot, heat the remaining 1 Tablespoon of oil over medium heat. 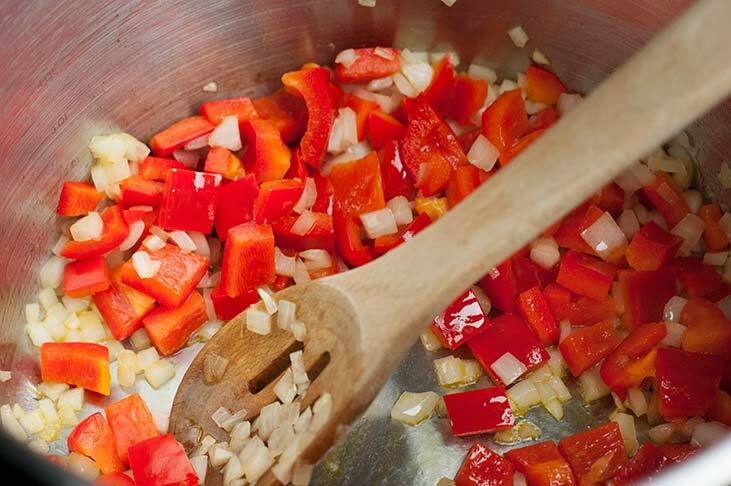 Sauté the Onions and peppers until they start getting soft. Add the garlic and continue to sauté for about 5 minutes. Add the tomatoes and dried spices to the pot and bring to a boil. 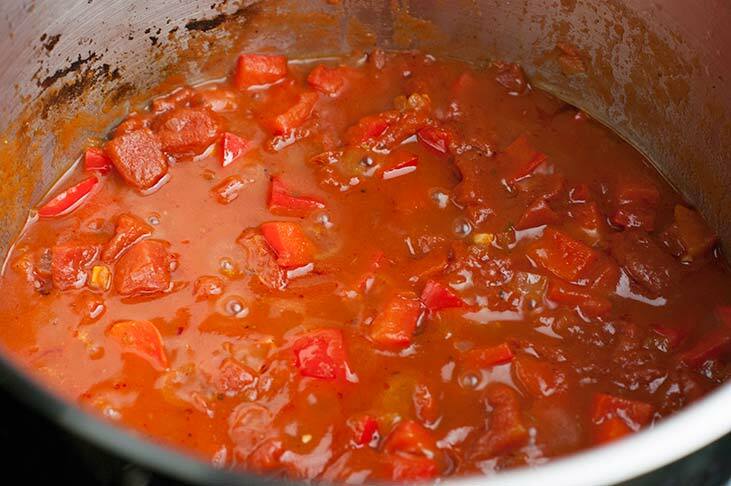 Reduce to a simmer and allow to cook for about 10-15 minutes. Pour into bowls and serve with Green Onions (scallions) sprinkled on top. You can also add nutritional yeast for Vegans or if you wish you can add some cheddar cheese for non vegans. I enjoy mine with a little fresh squeezed lemon juice on top as well. 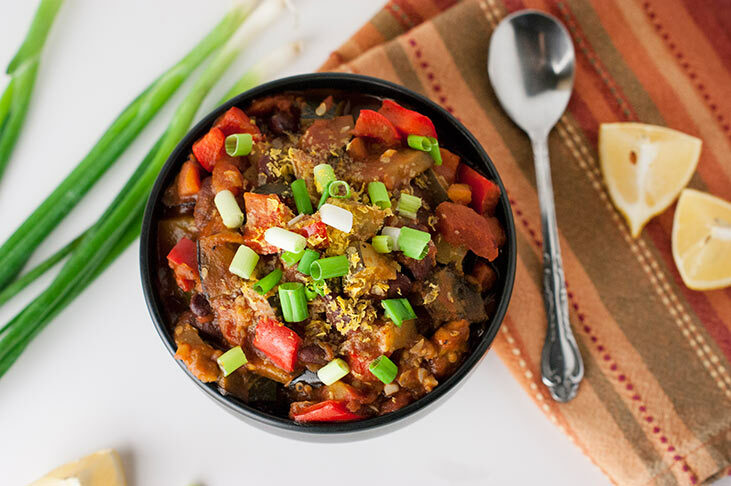 This vegan chili is just perfect for me to recreate for my Vegetarian family..thanks for sharing the great recipe, looks totally delicious and packed full of yummy flavour. Thank you Thalia! Hope you enjoy! Love your blog!! All of the treats look delicious!